The Newage MS-106 self-leveling vise fixure is designed for use with conventionally mounted samples and many unmounted samples. This fixture features an all-metal construction with a 2" (50mm) horizontal (diameter) capacity and a 1" (25mm) vertical capacity. An adjustable elevating screw incorporates a swivel anvil top which compensates for samples having a non-parallel surface. The top surface may be quickly and easily clamped in position against adjustable top holders, perpendicular to the indenter. The MS-106 vise fixture includes pre-drilled mounting holes for use with the Newage MT90 Series, HMV-2 Series and older model HMV-M (Type M) and HMV-2000 microhardness testing systems. Click on the menu below to see the full range of vie fixtures. 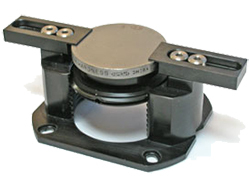 Self-leveling vise, for mounted samples.